Pharmaceutical manufacturers invest significant resources on designing product packaging and labelling to ensure positive brand identification. The result is often a consistency in product appearance. This similarity in packaging and labelling has been a contributing factor in medication errors reported. The above prescription was taken to a local community pharmacy for processing. The pharmacy assistant entered the prescription into the computer as Derma Smoothe/FS® Topical Body Oil. Upon checking the prescription, the pharmacist did not check with the patient or prescriber to confirm which specific product was needed. Derma Smoothe/FS® Topical Body Oil was therefore dispensed. Patient counselling did not take place as the patient indicated that he was in a hurry and his physician had already told him how to use the product. Just prior to retiring to bed, the patient opened the packaging to apply the oil to his scalp and noticed that the shower cap was missing. The following morning, the patient contacted the pharmacy to report the discrepancy. Following some investigation, the pharmacist learnt that the prescriber intended to prescribe Derma Smoothe/FS® Scalp Oil which contains two shower caps to be used during treatment. The physician did not specify the product prescribed. The pharmacist failed to confirm the indication for use and specific product prescribed. Both products are similar in appearance and are usually stored next to each other. Their Drug Identification Numbers are identical. (See photo). Patient counselling did not take place. To ensure the patient receives the most appropriate drug therapy, always gather the indication for use from the prescriber or patient whenever possible. Ensure that the patient receives appropriate patient counselling depending on the drug’s indication for use. Patient counselling not only ensures the patient uses the medication correctly, it is often the last opportunity to detect a dispensing error. 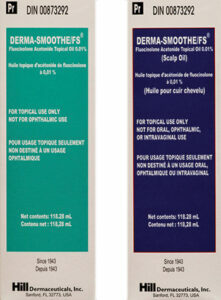 Derma Smoothe/FS® Topical Body Oil and Derma Smoothe/FS® Scalp Oil each has unique indications for use, directions for use and package content. Educate all pharmacy team members regarding the potential for error involving these two products. Meanwhile, consider storing Derma Smoothe/FS® Topical Body Oil and Derma Smoothe/FS® Scalp Oil in separate locations. Health Canada should consider assigning unique Drug Identification Numbers to each product to prevent future dispensing errors.